DR Exclusive Interview! 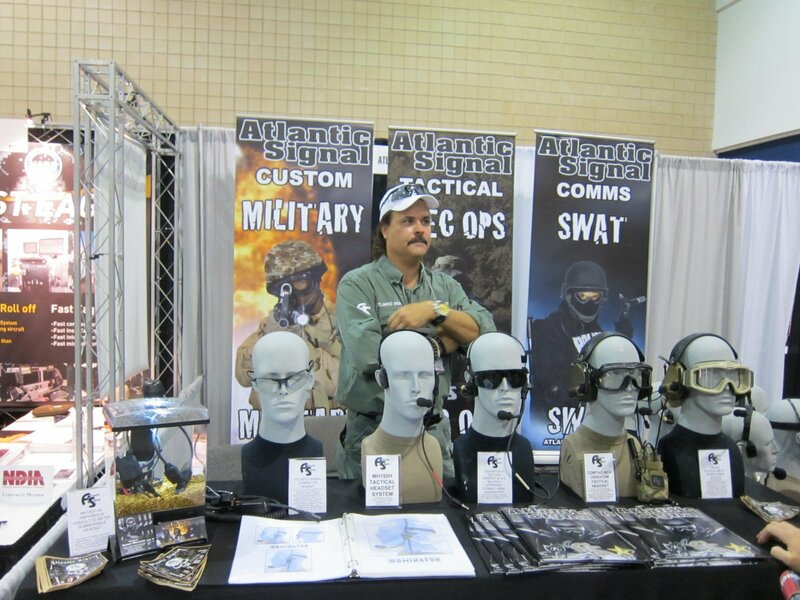 : Atlantic Signal (AS) Introducing The DOMINATOR Waterproof Bone-Conduction/Hearing Pro Military Tactical Communications Headset System at SOFIC 2011: Ultimate Custom-Built Tactical Comms Headset for U.S. Military Special Operations Forces (SOF) Assaulters/Operators (Photos!) | DefenseReview.com (DR): An online tactical technology and military defense technology magazine with particular focus on the latest and greatest tactical firearms news (tactical gun news), tactical gear news and tactical shooting news. All photos contained in this article were shot by DefenseReview.com (DR), and are copyrighted. DefenseReview.com owns the copyright on these materials. The photos were shot with a Canon PowerShot S90 10-megapixel digital camera (still camera with video capability). While the production-version Atlantic Signal (AS) DOMINATOR waterproof bone-conduction tactical communications headset system with integrated U.S. military-approved hearing pro (waterproof electronic hearing protection earpiece) will be making it's official debut in a few days at 2011 NDIA Special Operations Forces Industry Conference (NDIA SOFIC 2011), DefenseReview (DR) actually got a first look/sneak peek at an operational prototype version of it last year during NDIA SOFIC 2010. 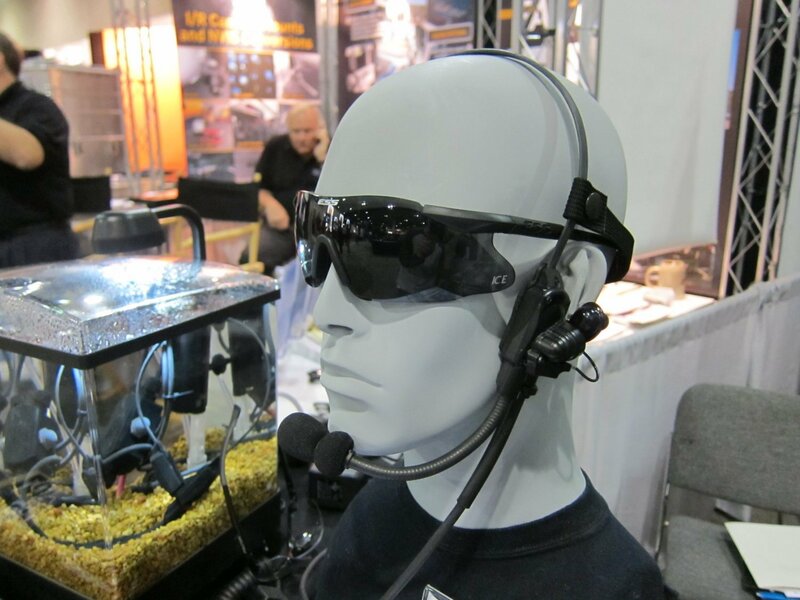 The DOMINATOR water-proof bone-conduction/hearing pro tactical comms headset was custom designed, developed and built specifically for a specific U.S. military Special Operations (SPECOPS)/Special Warfare (SPECWAR) team/unit with very demanding requirements, including waterborne and "over-the-beach" operations and direct action (DA) missions. The DOMINATOR custom tactical comms headset system represents the current state of the art in custom military combat/tactical comms headsets, and is the slickest and seemingly most capable tactical headset Defense Review has seen, to date, based on its specifications and the set of SOF requirements it was developed to meet, including reliability and durability during waterborne/"over-the-beach" operations. 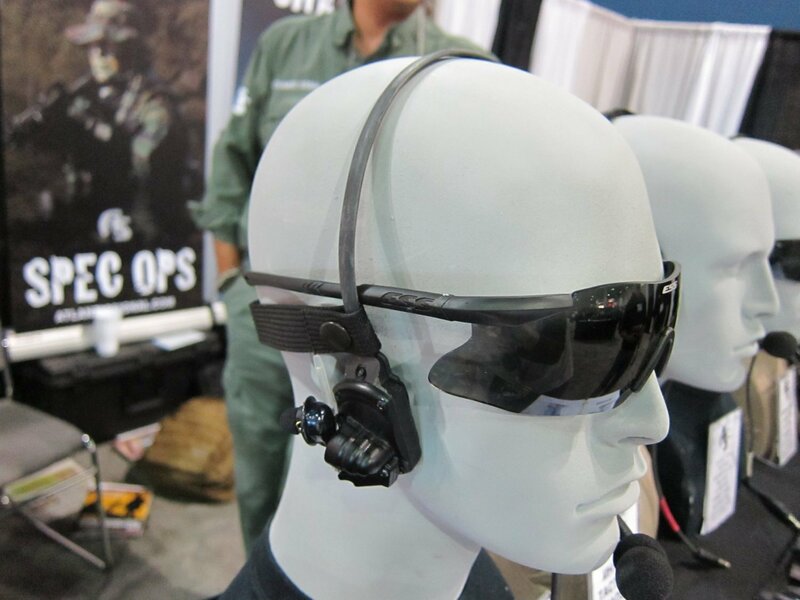 You can see The DOMINATOR "next generation tactical communications suite's" redundant bone-conduction/tactical hearing pro configuration in the accompanying photos. 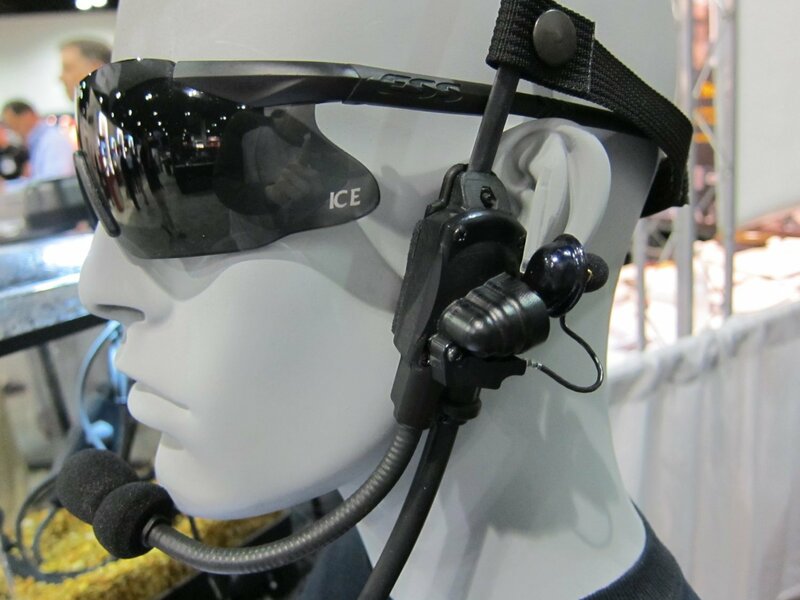 Visually, it would appear that The Dominator is a modified and tactically enhanced version of the Atlantic Signal Gladiator V tactical bone conduction headset (also featuring integrated U.S. military-approved hearing protection), with some mission-specific enhancements/improvements (unconfirmed/unverified). Understand that DR shot these photos at SOFIC 2010 in June, 2010, so the physical appearance and tactical capabilities of the system may have changed somewhat, since then. 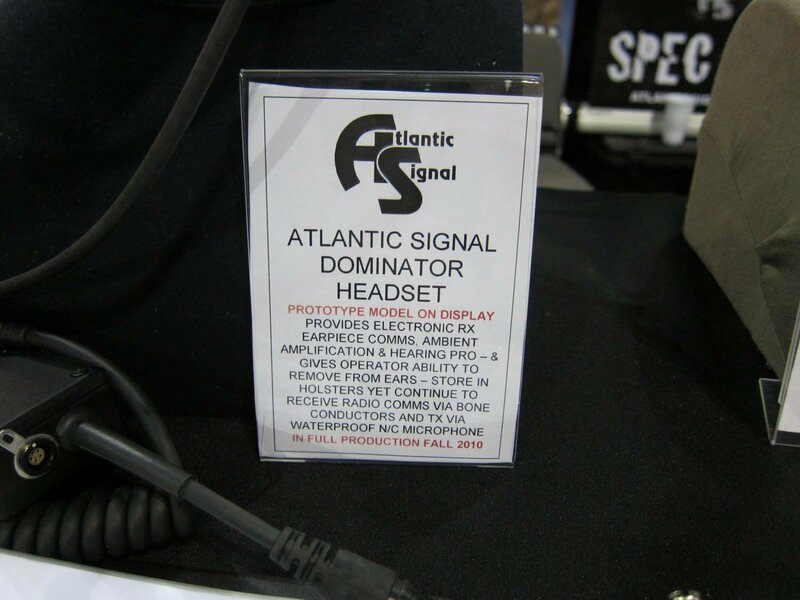 Whatever the case, The DOMINATOR would appear to be Atlantic Signal's highest-end military tactical headset, although all of Atlantic Signal's military tactical headsets are high-end. DR is curious as to whether or not the U.S. Naval Special Warfare Development Group (NSWDG)/DEVGRU (formerly known as SEAL Team Six, or ST6) assaulters/operators who recently assaulted/raided Usama Bin Laden's/Osama Bin Laden's (UBL/OBL) compound/hideout in Abbottabad, Pakistan and neutralized/killed Bin Laden were wearing AS Dominator headsets. It's certainly possible that they were, although this is just an educated guess on our part. 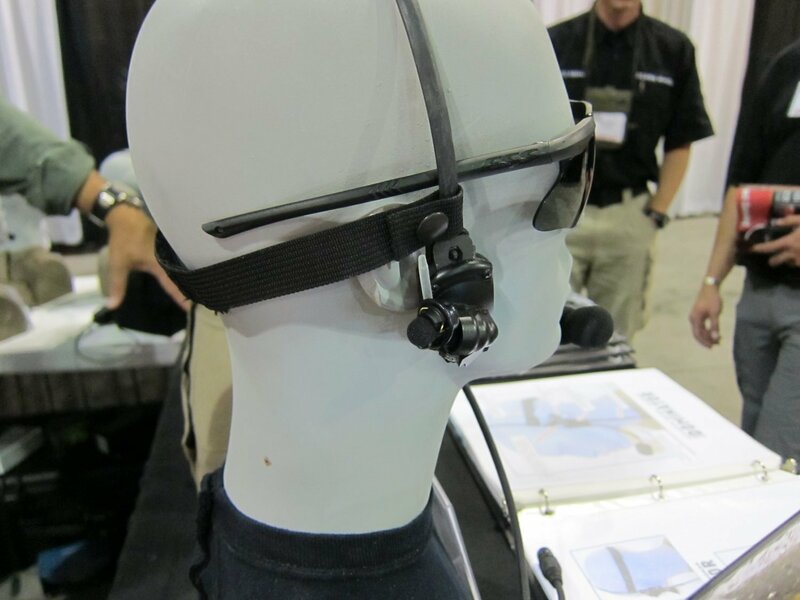 Defense Review recently conducted an interesting email interview on The DOMINATOR bone-conductive tactical headset system with Atlantic Signal's Randall Hedrick, and we recommend that our readers peruse it below. David Crane: What are the tactical/combat advantages The DOMINATOR tactical comms headset system enjoys over competing systems for U.S. military Special Operations Forces (SOF)? What does it enable the end-user to do that the current systems don't, or what does it do better than those systems? Why should SOF choose the Dominator? Randall Hedrick: The DOMINATOR was developed following a meeting in 2009 with one of the U.S. Military’s Elite Counter Terrorism Teams. The SMU (Special Mission Unit) had been using our standard bone conduction tactical headsets for well over a decade as well as several of our push-to-talk assemblies for their MSA/Sordin and [3M] Peltor headsets. We had completed the development of two versions of 20 meter submersible headsets with this same group of operators a couple of years prior. I was visiting the guys at Command and brought a set of miniaturized earpieces from a distributor of ours – PHONAK out of Switzerland. Phonak is one of the world’s largest digital hearing aid manufacturers and I believe provide more hearing aids for to DOD for U.S. Soldiers than any other manufacturer in the world. Phonak had developed a set of miniaturized earpieces that provided comms / electronic hearing protection and ambient amplification in a lightweight package for an overseas client to use on airport tarmacs. I brought along a set of those same Phonak miniaturized comms to the SMU for introduction and within about an hour the genesis for The DOMINATOR occurred. The concept – while simple on paper – involved incorporating one of our standard tactical bone conduction headsets with the Phonak product. That began a two year development project with the SMU that led us to the initial production of the DOMINATOR in May of 2011. The DOMINATOR will officially debut at SOFIC in Tampa the week of May 16, 2011. General complaints with competing ITE (in-the-ear) comms systems included discomfort, ear fatigue, less than stellar communications from in-the-ear microphones used to TX / continuous software upgrades / battery replacement and overall layout/design criticisms. Our commitment to the Counter Terrorism Team was simple – I would travel on site up to 2-3 times per month (usually with our Chief Engineer) with proto-type designs / concepts / modified components / alternative PTT and cable designs, etcetera. Their commitment? Provide constant input and criticism as well as test and evaluate everything we brought to them. The goals/expectations were many but the main focus was to provide a simple comms system that provided the end-user the ability to decide when and when not to engage hearing pro / ambient amplification. They did not want something in, on or over their ears at all times and particularly wanted a waterproof noise canceling/boom microphone to transmit. The system we designed was to have no software or need for batteries on the main radio platforms including the PRC148 and 152 radios – both urban and maritime models. Our RQT on the water exposure side was the typical 3 feet for 30 minutes. While I don’t want to go into great detail on all of the advantages of the DOMINATOR over competing products as well as the target improvement criteria issued us by the client – much of it is apparent once the headset is placed on the head and the radio is powered up. We have filed both design and utility patents on the DOMINATOR worldwide. I think the reason the product has been so highly praised and accepted is our commitment to the client and the client’s commitment to Atlantic Signal. While we provided our engineering and design expertise – The DOMINATOR is an end-user driven product like no other comms system I’ve seen. We reached every goal requested by the client following multiple overseas deployments as well as stateside evaluations. In each formal and informal Combat Evaluation we were involved in against the competition – the DOMINATOR came out on top. Crane: When did you first start developing The Dominator headset, and why? What were your goals? I'm looking for some detailed background on the project, if possible. Crane: What were the biggest challenges, if any? Hedrick: Fortunately Phonak committed time and resources to us on an as-needed-basis at a moment’s notice. They realized we needed to take their lightweight design (not originally intended for tactical applications) and toughen it up and design it into a tactical platform. They were constantly reminded of the expected abuse and environmental conditions the DOMINATOR would be subjected to. Atlantic Signal has been developing / designing and manufacturing tactical grade communication systems for 22 years and we were confident if Phonak cooperated and provided access to their audiologists and engineering team – we could reach the goals set forth by not only the operators but by our company as well. Phonak’s experience in the military field was limited to primarily wireless communications used for covert operations – their experience on the overt side was relatively non-existent when we started. Their contributions to this project cannot be over-looked. They constantly stood tall and met our RQTs as well as those from the client although I’m sure there were times they may have thought our requests were a bit over the top in terms of the performance expectations placed upon their earpieces and circuit board. Crane: What are the competing systems out there? 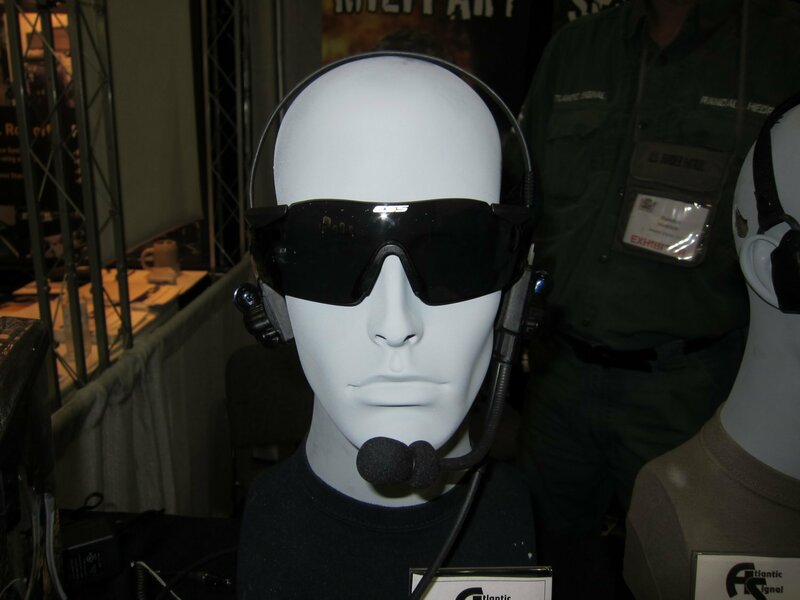 For example, what tactical comms headset(s) do you want the Dominator to either replace or beat out for contracts? Hedrick: I don’t really view the DOMINATOR as a direct competitor to [3M] Peltor – we have a great relationship with 3M/Peltor and actually private label products for them. 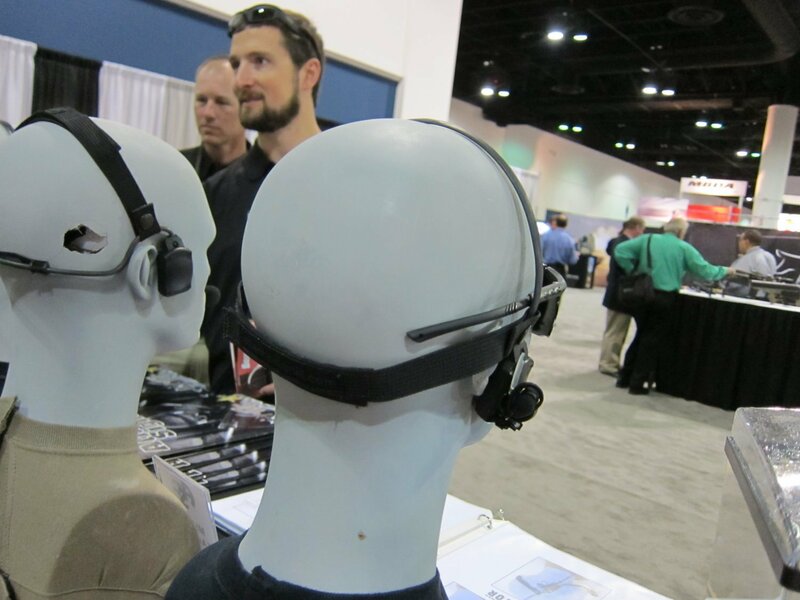 In fact, we invited 3M/Peltor to share booth space with us at the ADS Warrior West Expo in San Diego in May – they were debuting their new Com-Tac 4 [Hybrid] headset – a solid alternative to their circum-aural models. The DOMINATOR was designed in cooperation with the SMU and subsequently competed against products they had previously used in deployments or had evaluated stateside. Those headsets included Silynx, Nacre [QUIETPRO], Ultra-life SOCOM-X, INVISIO, and Racal [Acoustics]. I don’t think the perfect headset exists in the marketplace and there are probably niches for most manufacturers; however, I believe some models/manufacturers will fall out of favor over time due to design issues or lack of a manufacturer’s ability to react to client modification requests extremely rapidly. I think the word has spread throughout the SF community that Atlantic Signal/Phonak will do anything we can to meet the client’s needs and we travel constantly all over the country to meet with operators to discuss needs/wants and dislikes. I know Defense Review has interviewed some of the trigger-pullers directly involved in the DOMINATOR’s development from day one so I’m certain you’ve heard what kind of company we run and how our personnel react to end-user requests. It has always been that way and will never change – it’s part of the company’s culture. With all due respect to all of the giant corporations and defense contractors out there – you can have your big chunk of the defense business. We’ll stay small enough to not have to go to a Board of Directors or team of lawyers to request funding or permission to make a component or design change. We’re swift to react and honest to report back to the client whether or not we can meet their RQTs. There’s no BS in our relationships with the end-users. If we commit – we perform. Crane: How much do the Dominator headset system (by itself), and the complete tactical comms system (with radio, batteries, etc.) weigh, respectively? Hedrick: The DOMINATOR differs from the over-whelming majority of ITE comms systems on the market today. While most have devices that must be worn in the ear at all times to maintain both RX and TX capabilities and are tethered to their respective PTT systems, the DOMINATOR was designed off of a platform that includes a head frame with adjustable rear hook and loop adjustable rear strap. The frame distributes weight evenly and provides stability on both sides of the face and crown of the head. Each headset side piece includes a bone conductor for receiving radio communications via the facial bones. Also on each headset side piece is a holder for each electronic ear piece. The holder acts as a place to stow the earpiece when not being used. The ergonomic design of the holder makes certain the earpieces do not dislodge during rigorous activities. When the operator is approaching a target, he/she can remove each of the earpieces from their respective holder – easily positioning the earpiece in each ear. The earpieces provide a secondary source of receiving radio comms plus provide electronic hearing protection. Furthermore, the DOMINATOR’s push-to-talk system features a push-button volume control – providing volume increase/decrease of the operator’s ambient environment when wearing the earpieces. Rather than attempting to transmit from the ear canal as most of the other systems do, we provide a robust, waterproof, noise canceling microphone on an articulated boom arm. I’m sorry, but I believe we were given ears to hear – not speak with– that’s the reason you have a mouth and why we provide a boom microphone to speak into. The DOMINATOR systems are custom built per operator or team and both dual and single comm. systems are available with a myriad of cables to include Smart phones, ICS, MP3s, jump masks, both the AVON USSOCOM FM53 and JSGPM M50 breathing apparatus, secondary PTTs, Peltor transition cables and more. Cables and headsets are available initially in black, coyote and olive drab. We just completed a ruggedized / swimmable 2 wire low-visibility kit for use with the DOMINATOR system as well. Crane: How much does/will the Dominator cost per unit, all in, and can you provide an itemized components cost breakdown? Hedrick: Cost varies depending upon specific clients RQTs and the model of radio(s). Pricing starts around $2,000 per unit initially. Crane: Is The Dominator fully developed, or do you want to advance/improve the system/technology even further over the next few years? Would you like to make any specific improvements? If so, what are they? Hedrick: The first generation of The DOMINATOR is finished and in production this week (9 May 2011). It was a RQT with the SMU that we agree to constant upgrade evaluation / consideration which we committed to and are already working on. There are some pretty cool Generation II options coming out in a couple months – which can be utilized with Generation I models of the DOMINATOR. Crane: What specific environmental factors does a tactical communications headset have to be able to [handle/endure] during SEAL operations, and can The DOMINATOR handle all of them and remain fully functional? If not, what kind of protective procedures need to be performed during various operations, including waterborne/over-the-beach ops? Hedrick: Our client had two main RQTs – IP67 swimmable which the DOMINATOR is and that meets 98% of their operators needs. Secondly, there were some underwater EOD RQTs and we had to have a headset that met that RQT as well although it was certainly not needed by the majority of operators. Taking a product that needs only meet a RQT of 3 feet for 30 minutes and modifying it a 20 meter RQT – takes the product so overboard in design and water ingress protection that the product’s performance ultimately suffers. We took the view of not over-engineering the comms system that the over-whelming majority of the operators needed (DOMINATOR) and simply made a secondary headset for the minority or operators that have a 20 meter need (AMPHIBIOUS ASSAULT models). Crane: What's the difference between SEAL requirements for a tactical comms headset/system and U.S. Army Special Forces requirements? Hedrick: Some of the difference was referenced in the previous question but I also believe the platform we designed [for] the DOMINATOR allows for unique modifications and RQTs aside for those of a more traditional nature. We are working now with some units outside our initial development SMU to provide some more mission specific components for their unique sets of needs. Crane: How many military spec-operators were involved with the Dominator's development, and how/why were they each chosen for the project? Hedrick: The Counter-Terrorism Unit provided access to dozens of operators with a constant contact team of a hand-full of operators with either an assaulter or comms emphasis so we could understand and address each operator’s specific RQTs. Crane: Is the DOMINATOR operational, yet? Is it already being procured? If so, when did that start? If not, when will it go into procurement? Hedrick: It is operational now and orders were placed as far back as the end of last summer for production models when they were available. We’ve distributed prototypes in various iterations since January of 2010 to most branches of the U.S. Military for feedback and all of it has proven of value. Several single and dual comm. DOMINATORs have been fielded by a couple high-profile tactical units on the Federal LE side as well. Both formal and informal Combat Evaluations have taken place since the beginning of 2010 and while I can’t speak directly to the outcome of informal evaluations – suffice it to say, we have been very pleased with each and every competitive evaluation and have learned from and subsequently implemented many suggested changes/improvements to the DOMINATOTR as a result. I believe nothing is more crucial to a product’s evolution than both positive and negative commentary from the intended end-user base. Anyone that tells you otherwise – is destined to develop a product that will ultimately fail. Crane: Was the Dominator developed just for the SEALs, or for all SOCOM/SOF personnel? Hedrick: It was agreed going in that we wanted to develop the DOMINATOR for not only the Counter Terrorism Team but also the brothers they fight alongside. The SMU provided constant contacts from across the SOCOM/SF community – allowing us to reach out and offer test and evaluation units. Crane: How deep underwater can the Dominator go, and for how long? Hedrick: 3 feet / 30 minutes is the standard RQT. As mentioned earlier – we also have two models of 20 meter headsets available for that unique group requiring as much. Those two models are known as the Amphibious Assault headsets – built for the 20 meter PRC148 MBITR from THALES – although rumor has it that Harris is going to offer a PRC152 – 20 meter counterpart. I’m confident we’ll interface to their 20 meter model as well – should it surface and be implemented by the military. Crane: What kind of routine cleaning and maintenance does the [DOMINATOR] system require? Hedrick: Primarily the typical wash down following saltwater exposure. The earpieces are available in two different styles – foam and silicone and 3 sizes of each and should be replaced on an as-need basis. We designed the earpiece interface to be field replaceable if necessary as is the tuck tab assembly mounting platform for the DOMINATOR PTT box assembly. Additionally we designed and developed a super cool Pelican carry case for the DOMINATOR with custom cable pouch and foam cut outs to store the headset and PTT box. There’s also a DOMINATOR patch that can be attached to an operator’s vest. The case features laser engraving on the cover including the DOMINATOR Dragon logo. Many players are to be thanked for the development of the carry case including Pelican / London Bridge Trading and our distributors at Simmons LE. Crane: What were all the performance specs the DOMINATOR had to meet? Can you list them? Hedrick: The DOMINATOR had to meet the previously mentioned IP67 RQT (all components) and of course had to work with various ICS systems, interface to the client’s breathing apparatus (something we did differently than competitors have) and interface to MP3 players for various RQTs as well as Smart phones. There needed to be a method of connecting the USSOCOM approved and issued Peltor ACH headset and of course our headset style had to be compatible with a multitude of helmets on the market. 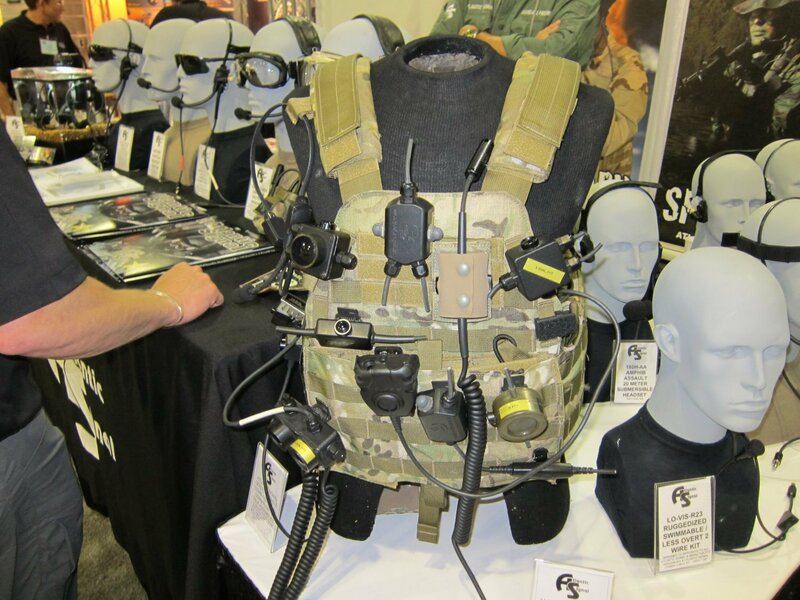 We created, for the client, a couple of unique pieces that subsequently became part of their RQT package – including a jump mask PTT and extremely small chest mount PTT. There are some other pieces coming to market soon that I’m not at liberty to discuss. We also designed the DOMINATOR in such a manner so as to allow for the boom microphone to be worn on the left or right side of the head – this feature allows an operator to wear the headset with no cheek weld issues when using a long gun. Crane: Can you provide a list of all the features/components of the DOMINATOR system, including the Push-To-Talk (PTT) button and why those specific components were chosen for the Dominator? Hedrick: Right now we have single and dual comm. headset models and the individual operator can choose to have his/her PTT actuation buttons positioned inboard or outboard for single comm. models and either both inboard or an inboard / outboard configuration for dual comms. Cables feature what we consider the finest connector and receptacles on the market. All metal components are blackened and each cable connector is color coded and keyed to only connect to their respective PTT box mounted receptacles – there’s no way to accidently plug a cable into the wrong receptacle on the PTT housing. Many are 90 degree angled to meet SMU RQTs. Cable lengths are custom cut according to client’s needs. Cables are available currently in OD / Coyote and Black – working on a Multi Cam now also. Cables include radio connector-cables/ MP3 / Smart Phone / Peltor Transition / ICS / Lo-Vis 2 Wire, FM53/M50 Mask Interface / Jump Mask / Chest Mount and more to come – both wired and wireless. Cable design and development was directed by the SMU as was the PTT box design and method of attachment to a MOLLE vest. The Big M4 Myth: "Fouling caused by the direct impingement gas system makes the M4/M4A1 Carbine unreliable." Previous: Action Alert! : DefenseReview.com (DR) Nominated for Two 2011 Gunnie Awards! Please Vote for Us! Next: DefenseReview (DR) on the way to the 2011 Special Operations Forces Industry Conference (SOFIC 2011) in Tampa!